The tickets allow you to meander through the gardens, along very clearly set tracks. We’d turned up a little early, and in the biting cold, we wandered around an open space outside the garden walls, where we were able to see a couple of “street gate” style lanterns, and enjoy all the fun of the eateries and street markets, by which I mean the two souvenier stands, and a churro stall. 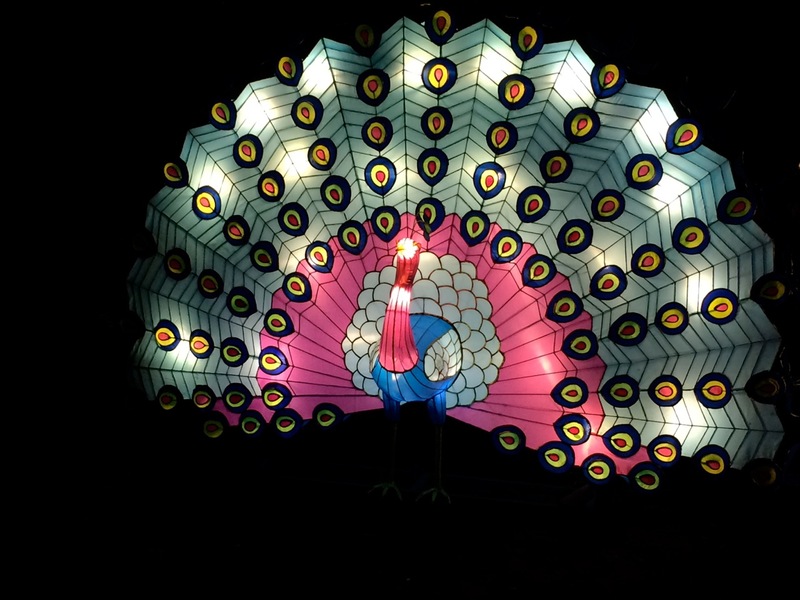 Mere moments before the cold became totally unbearable, we were finally let past the barrier into the gardens, and walking under a canopy of multi-coloured lotus flowers, and along hedge walls strewn with thousands upon thousands of lights, the excitement began to warm me. 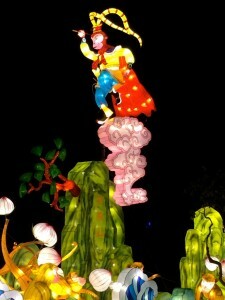 The lantern shows that were part of my childhood in south China, took place at the end of the fifteen-day Spring Festival extravaganza, on the first full moon of the new year. Like the flower markets, each district of major cities would hold their own show in parks. Children carried their own lanterns, either homemade or bought from traditional craft shops, to see the show. The entire grounds of the park would be filled with light. Loudspeakers would blast traditional festive music (usually with a lot of percussion), as one wandered over bridges, through bamboo groves and pavilions along the lake. Any patch not filled with illuminated silks, would be an abundance of winter flowers, and you were never more than a few metres from a stand selling delicacies on sticks, candy floss, or multicoloured flashing trinkets. It was very much a celebration of the triumph of light, and the joy of life in the middle of the dark, cold winter. The lantern show at Chiswick House is a rather different affair. The number of installations were many, and the lanterns themselves large and impressive, but spread out around the entire grounds, so each single lantern or tableu was to be considered in isolation. With no music, inviting stalls or outdoor heating, it felt far more like an exhibition than a “festival”. The cold weather, and staggered start meant that it was by no means crowded, and apart from snippets of conversations from fellow attendees, the only other sound was the rather startled call of the swans, probably wondering what the hell was going on in their home at this time of night. 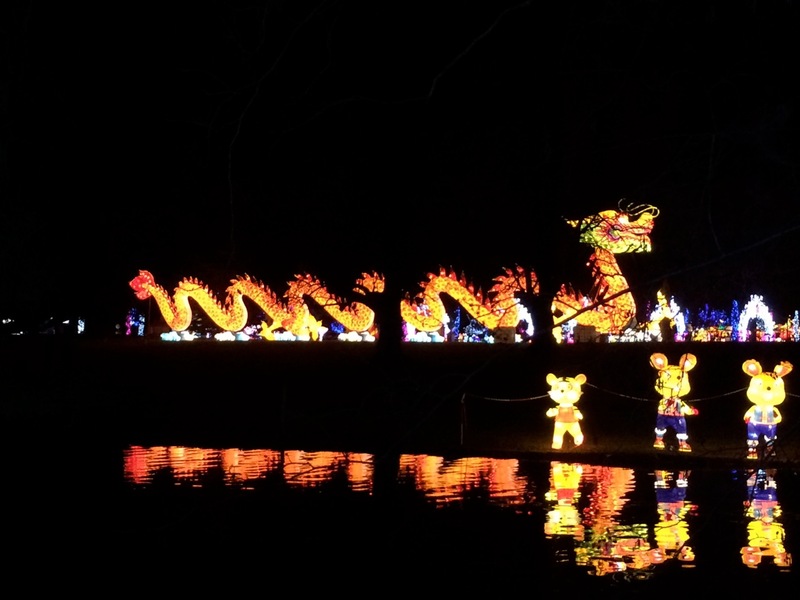 Mixed in with traditional displays of lotuses, peach trees and pagodas, were what felt like left-overs from 1980s Chinese children’s theme parks and cartoons. Giant surreal mushrooms, ants on see-saws, bears and pigs in human clothes, and a rather grotesquely twee rendition of the twelve zodiac animals, lined up on plinths in a manner that reminded me of lugubrious statues lining the entrances to Chinese imperial tombs. Despite this rather creepy discord of crass imagery and reverential quiet, there was a magical atmosphere. After some initial, very tasteful standalone pieces spaced out along the paths among the trees, we came to a long and wide stretch of grass upon which a vast range of luminescent animals were gathered. 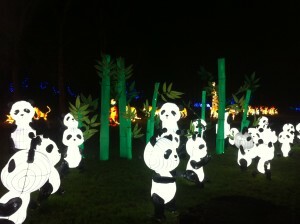 Frolicking baby pandas, peacocks displaying their colourful feathers, giraffes, oriental elephants, galloping elks and deers. I felt immersed into a magical, almost Ghibli-esque forest. 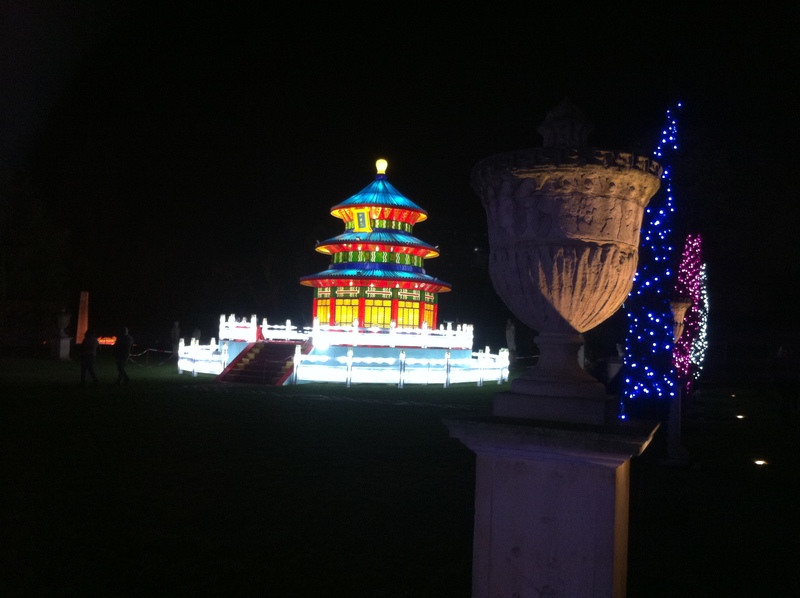 I was also thrilled to see beautiful manifestations of traditional Chinese culture, against the backdrop of the Earl of Burlington’s 18th century villa. An immense dragon flying towards Chiswick House, the Temple of Heaven surrounded by Italian statues, or the installation of the Qin Shi Huang Emperor with his chariot and Terracotta Army, flanked by neo-classical stone urns. 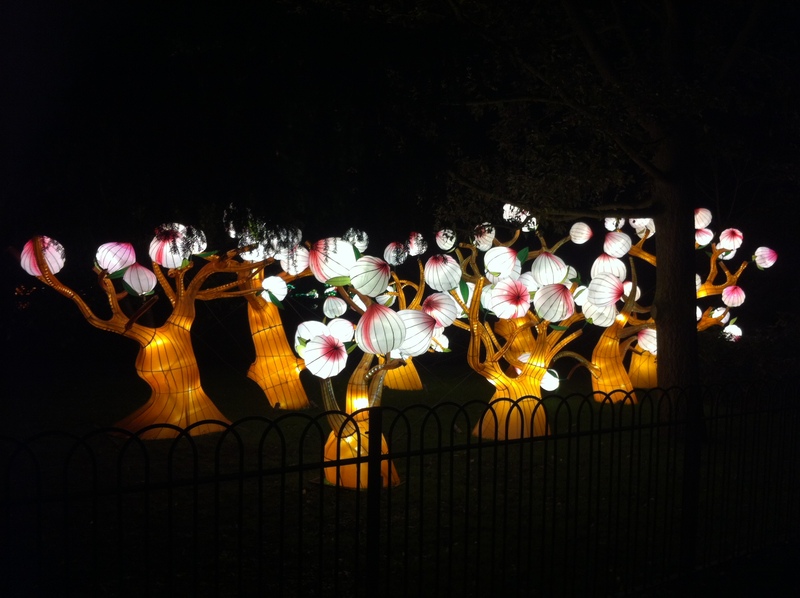 One of my favourite displays was the beautiful peach trees. Set amongst the garden’s own trees, and semi-hidden, their revelation as you turned into the grove was rather magical. 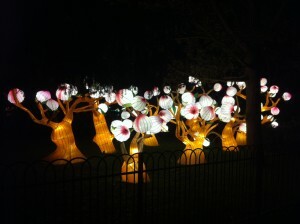 The translucent white and gradient pink of the peaches stood out so well in the night, and the tree trunks bent with elegance and oriental suppleness. 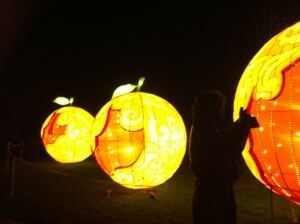 Peaches are a symbol of longevity in Chinese culture. Oranges are also considered a lucky fruit because the word for orange 桔 is homonymous with (and indeed shares the same right-side character as) the word for good fortune, “Ji” 吉. The giant oranges were charming. I loved the Chinese style curling cloud patterns on their skins. Each one was designed with an opening to reveal their “juicy” flesh, though there was an inescapable similarity between them and a certain ghost munching hero of 80s computer games. As we crossed the Classic Bridge and walked along the lake, we came to another of my favourite installations, aquatic and waterside animals, koi carps, frogs, cranes accompanied by budding lotuses, illuminated like an ink wash painting brought to life. At the end a pair of giant Mandarin ducks in bright folk colours. One perculiarity to these structures, were the amount of tethering lines each lantern had. These very light models were obviously shipped over from China, rather than being produced for the UK weather, and modifications were having to be made. Small groups of technicians were patrolling the grounds, ready to leap into action if the British weather or a blown bulb threatened to interrupt proceedings. 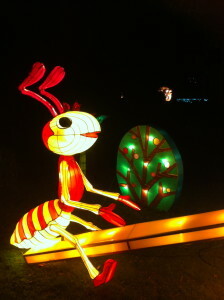 In fact, some displays, such as the see-sawing ants and the Journey to the West inspired “Mountain of Flower and Fruit” display seemed to be lacking elements of movement to which the machinery, or the sparse publicity had alluded. I had been anticipating something spectacular, and found myself confronted with something that was merely beautiful and interesting. 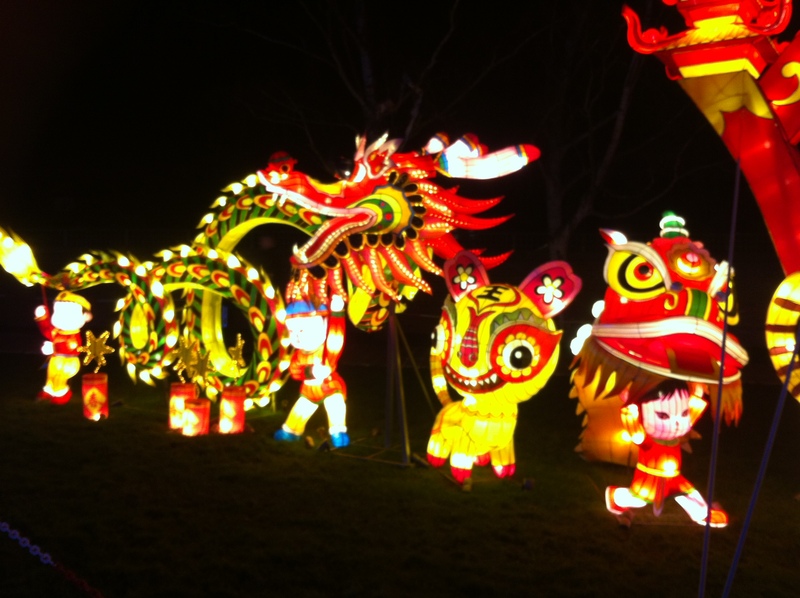 The lack of grandeur, and the lack of focus detracted from what is certainly an impressive collection of lanterns. We ended our designated route with a giant pink and yellow heart-shaped monstrosity, surrounded by smiling sunflowers, a couple of them with holes in the middle for people to stick their heads through. The sort of thing that only the Chinese could come up with. A pair of bored looking photographers sat in the cold freezing, with no interest from the passing visitors, who were all making a swift beeline back to Chiswick High Street in search of hot food, or just somewhere to warm up. 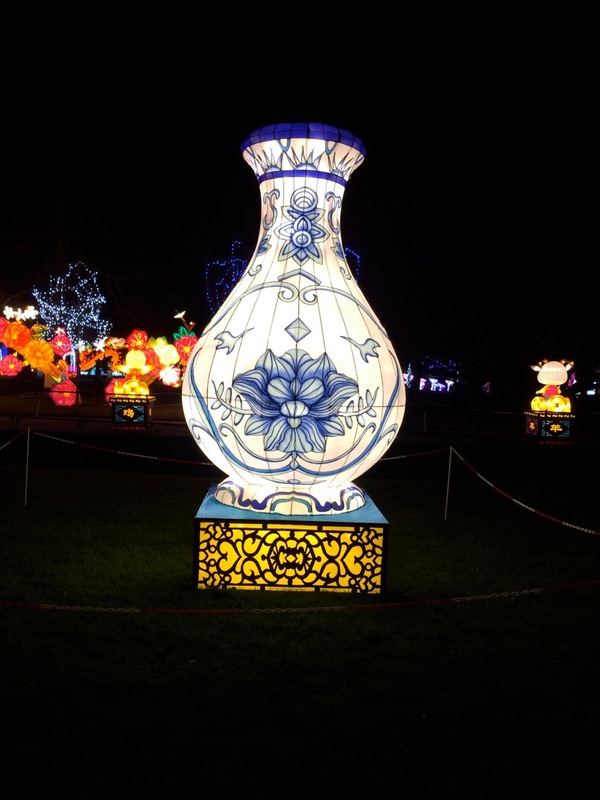 We left the grounds through a tiny gate, flanked by a pair of European nutcracker lanterns, which were so terribly produced, they’d not even bothered to switch them on. I was glad to have seen this strange, somewhat eerie depiction of an event which had filled my childhood with joy, but on the whole, the experience felt as though it had been survived, rather than revelled in. If you do get an opportunity, your experience may differ, as a) you won’t carry the expectations I had, and b) any early dificulties may have been solved. Wrap up warm, have plenty to eat beforehand, don’t arrive too early, and if you don’t want to end up feeling like you’re in “Five Nights at Freddie’s”, go with a group of friends. 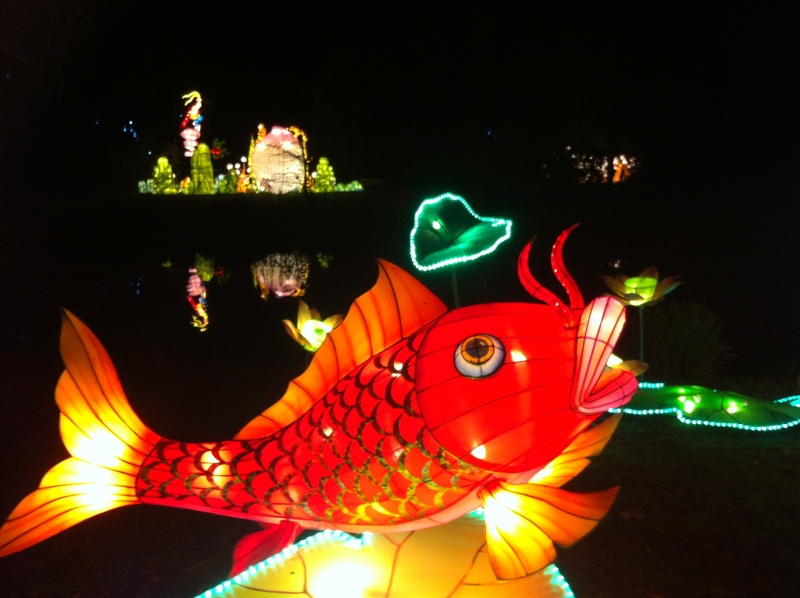 The Magical Lantern Festival runs until March 6th. 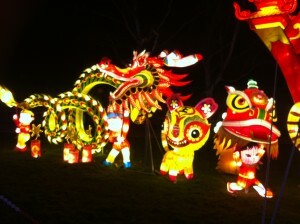 Chinese New Years Eve (7th February) has completely sold out.